Winter, spring, summer, or fall—the playgrounds in Pennsylvania are fun for families year-round. Whether you and your kids love to play on the swings, slide, or in the pool, these 10 awesome playgrounds will bring you a day of fun. Channel your inner child (and have fun with the kids!) at the best playgrounds in the Keystone State. Philadelphia's Penn Treaty Park sits at the heart of the waterfront and welcomes locals and visitors alike. The park's new playground, which is ADA accessible, was recently installed in 2016. Swings, slides, and tunnels complement the playground, so kids of all ages can enjoy. Doylestown's Kids' Castle park was designed and named by children in 1996 and has remained a local favorite since its opening on June 22, 1997. The main, large castle structure appeals to children ages 5-12, while tot swings are available for children ages 2-5. A restoration/rebuild project was undertaken by Save Kids Castle in 2013 and is still underway today. Kiwanis Park features a playground, two tennis courts, street hockey, a pickleball court, ballfields, basketball courts, and a pool. Bring the whole family for a day of fun for everyone—get some sun—and then cool off with a dip in the pool. Sounds like a perfect summer day, if you ask us! Emmaus Community Park is the largest park in the borough. In addition to playground equipment, there's a swimming pool with a slide, a walking path, courts for volleyball and basketball, and sports fields. Whether you and your family enjoy passive or competitive recreational opportunities, they're all here for you. Blue Slide Playground, located in Pittsburgh's Frick Park, is so well-known that rapper Mac Miller named an album after it. Kids love the playground and can also take advantage of the Frick Environmental Center to learn about nature during their play days. Fun and learning, what could be better than that?! Limerick Community Park is home to the Manderach Memorial Playground, which houses a two-story heart-shaped slide, saucer swings, a dragon-shaped figure for climbing, and a smaller, castle-themed playground for little ones. 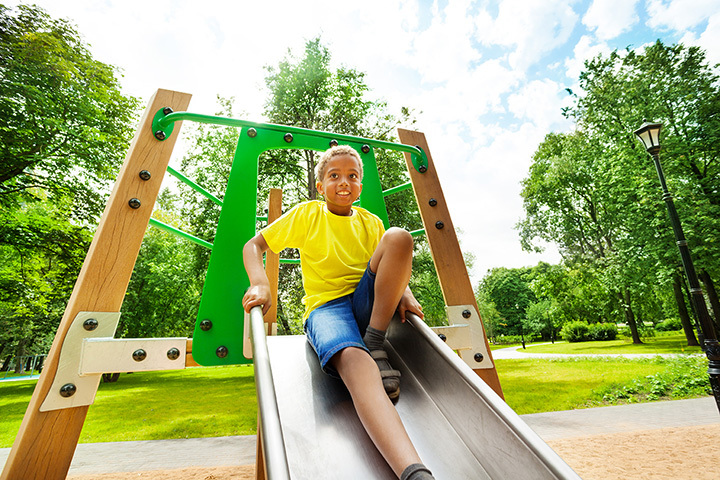 Kids of all ages love the playground and Limerick Community Park for its various amenities—from sports fields to volleyball and basketball courts, to name a few. On the first Monday of each month, the playground is closed for maintenance from 7 a.m. to 2 p.m.—but kids can still enjoy the rest of the park! In Allentown, Lone Lane Park provides local children with a large playground to play on. There are active play components such as swings and slides, and an open, grassy area with plenty of room for games and other activities. Kids can also play sports on the fields, basketball, volleyball, and explore the walking path. The ADA accessible memorial park has 50 acres of developed parkland for families and children to enjoy—with more developments coming. There's also a playground, of course, a tricycle track, and fields and courts for various sports—so kids of all ages (and their parents, too) can enjoy the park. Nay Aug is the largest park in the city of Scranton—and grants visitors of all ages with "a touch of nature amid the city landscape." Among the many attractions are not one, but TWO playgrounds, Olympic-sized swimming pools with waterslides, rides for kids, and a whole lot more. Bring your whole family and experience the excitement of Nay Aug for yourselves...today! Philadelphia's children ages 10 and under love the Smith Memorial Playground & Playhouse—which offers a wide range of activities, places to play, and toys for them to use—all for free. The Playground spans six and a half acres and includes a giant wooden slide, along with 50 other pieces of accessible equipment for children to play on. Keep up to date with Smith's events on their website, so you don't miss out on awesome activities like Kidchella, a music festival just for kids!